Attic Progress… And I need your help! As I shared on instagram, it’s marathon painting week at Maison de Pax. We’ve primed and painted and painted and painted our laundry room (which sadly, yes, is a project we began months ago). Hopefully we can organize that space soon to share. 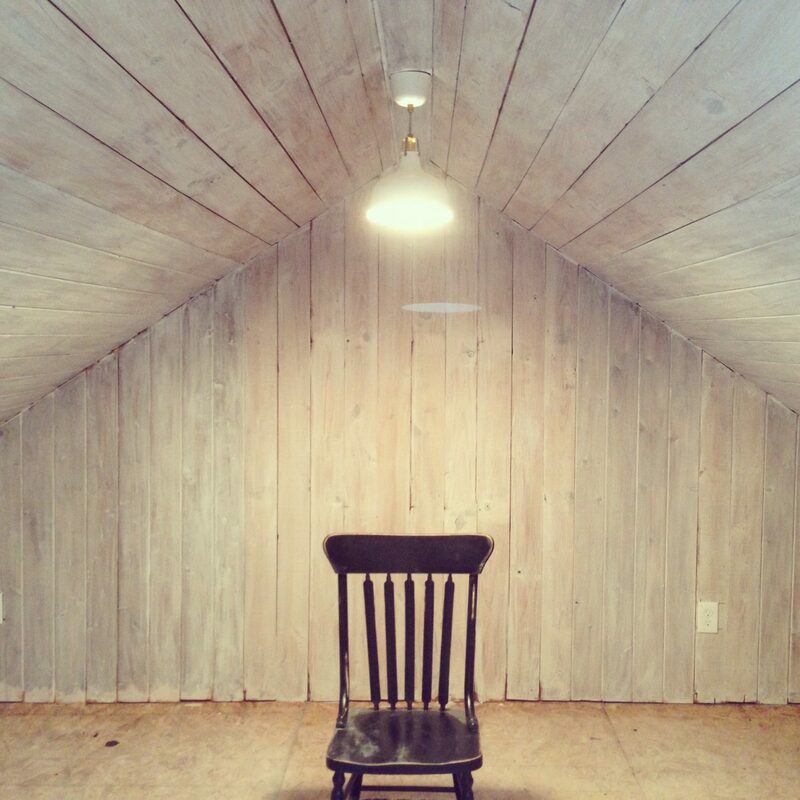 In the meantime, we’ve also stained and whitewashed and painted our new attic space. We are making final decisions on the flooring and hoping to lay that and finish trim this weekend. My favorite inspiration picture right now has similar whitewashed planks, deep brown floors, and beautiful white, vintage furniture. And now I’m thinking I’m not a huge fan of that glory. 😉 I’d really like to paint it white. 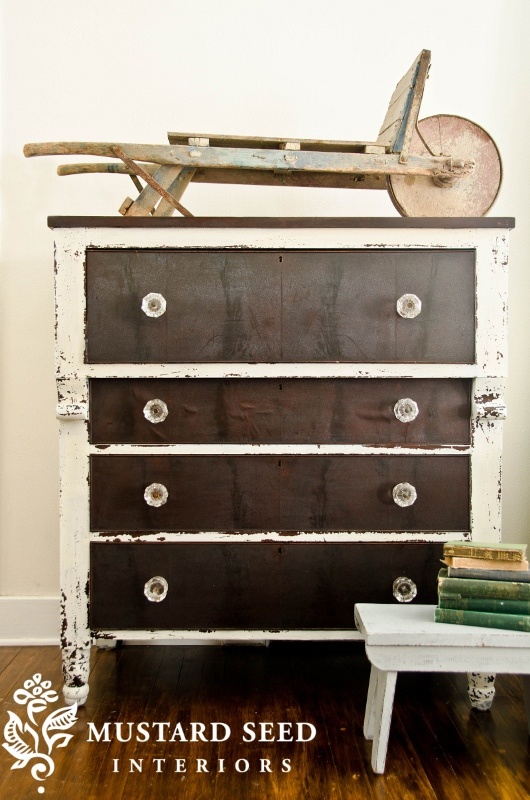 Probably use milk paint so it can have some beautiful chippy goodness… Maybe Miss Mustard Seed’s ironstone or grain sack. So here’s my question: should I paint the bed? And destroy all the hard work I put into it before? HELP! I actually like the bed the way it is, and think that it has a nice presence. I wouldn’t paint it; although I am a fan of painted furniture, I do wonder sometimes if we’ve all taken things a bit too far! It seems like everyone is doing the “paint it” thing – why not let the wood stand out with this piece? Thank you so much, Joyce! It is kind of addictive to paint furniture, isn’t it? I always remind myself that it’s MUCH harder to unpaint than it is to paint. Thanks for the help! I think you should put it in the room and then decide…. I know, groundbreaking, right!? The wood tone may look great with all the white! Btw, so loving your attic space! Our whole upstairs is peaked rooflines that I’m learning to embrace! It’s definitely a challenge to decorate around! Thanks, Stephanie! So many great suggestions! 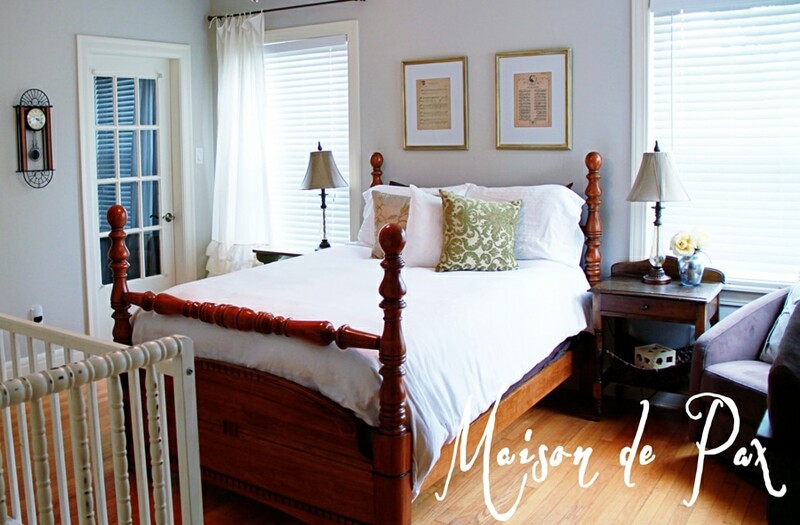 Wow, your attic space reminds me of a spread in the March issue of Country Living Magazine. Did you see it? It’s a Victorian cottage makeover. I love your inspiration photo, too. Lovely! I know you attic room will be so pretty when your finished. You’re off to a great start! Oh my goodness, that might be the best comment I’ve ever gotten! I’ll have to go check out that issue right now. Thank you so much! Wow! What an awesome space! Love all the planks , the vaulted ceiling and the whitewashed effect. Gorgeous! Wish I had an attic room, this is so dreamy. I think you will be happy that you decided to go lighter. We have medium color wood flooring in our home, but everyone that I know that has dark wood has said they’d never choose it again. Just wanted to give you something to think about, that is so much money to spend and then not love it when it’s done! I have always wanted wood plank walls, so I am living vicariously through you, can’t wait to see the finished room! This is a fabulous space! My head would be spinning with creative ideas to decorate! I love it. Ok so to paint or not to paint…..while I think it would be great painted and aged…..I also think perhaps a good old dark stain would be great! Everything else could be white or chipping white…texture but the bed could be nice and dark! Oh hello from tutorials and tips linky! This looks great! I would love to refinish our attic one day. What great inspiration. Don’t touch the bed unless it’s to darken the stain. At least live with it a while before you decide what to do. In the meantime, put a bedskirt on it, a long one going from top of springs to floor, that will cover the sideboards and footboard and change the bedding to coordinate with the bedskirt. Use some painted dressers and nightstands. That might be enough paint in the room. Tough decision, Rachel. It is absolutely stunning the way it is, but I do understand your desire for a painted look. I am going to be no help whatsoever and say that since I have seen some of your other projects, I am sure it will be just lovely no matter what you choose! I think you should paint it, even though it’s already beautiful I think it will meld well being light in a lighter space. Haha! Sounds like your husband and mine are straight out of the same mold. 😉 So glad you came by!! Hi Rachel, now that’s a tough one. To paint or not to paint? You did such a beautiful job restoring it, it looks amazing. Who knows, once you get it in the room maybe the wood frame will look better/grow on you. If it were me, I’d probably see what it looks like in the finished room before deciding. Thank you SO MUCH, Meg! Can’t tell you how much your sweet comment means. 🙂 We actually just moved the bed up there this evening (well, honestly, my husband and father did… I haven’t even been up to see!). Hopefully I can make up my mind once I see it up there! Wow! What a Beautiful space! Thanks for linking up! We can’t wait to see what you share next Monday! Hello Rachel. My attic looks exactly like yours before renovating. Do you have any information from beginning to end, because I would definitely love to redo our space? That’s a great question, Pam! I don’t currently have a start to finish description right now, but I just may need to put together a post like that. Roughly speaking, we hired someone to do the following: insulate, frame for sheetrock and planks, hang the planks, sheetrock the walls, and put in plywood floors. We then whitewashed and finished out the planks, primed and painted the walls, laid laminate flooring, added trim (baseboards, etc. ), and hung doors. I hope this helps and that you are able to makeover your space so you love it!